We currently offer partial and full day coverage. Both collections include a complimentary engagement session (because we want to hang out with you and create some cool art before the wedding!) and a print credit for artwork, gift prints, and albums. In today's day and age, what do we do with our images? Yep...immediately put them online. I do it too, and there's nothing wrong with it. However, social media is short lived. Who will want to flip through Facebook at 60 years old? There is something extremely special about holding your memories and artwork in your hands, flipping the stunning pages and reliving those moments. I believe in albums so much, that we've started adding a print credit to our collections. BECAUSE THESE MEMORIES DESERVE BETTER. A premium handcrafted album combining both matted and flush pages. Galleria mats feature inset, hand-trimmed images with a surrounding accent lining for an extremely luxurious and classic look. A contemporary flush-mount album designed for showcasing full panoramic prints. Unique and unrivaled in presentation, the Fine Art Book uses seamless page craftsmanship to generate its distinctive style. A fresh and innovative thin page album. Designed and crafted with seamless panoramic prints and a focus on clean lines and simplicity. What would you consider your style? How long have you been shooting weddings? What is the process after the wedding, and how many images will we receive? Do you backup your images? Do we receive the digital gallery? Do you travel for weddings? If so, how far and how much would that cost? Will you also shoot our engagement session? Do you photograph any formal photos on our wedding day? We REALLY would love to work with you, although you may be outside of our budget. We always will have two photographers present at your wedding when booked from our collections, each with two professional camera bodies. Having two photographers allows us to work together to tell your story, especially when events are happening at separate locations (i.e. during the bride/groom prep) and during the big events, when there are several angles that deserve to be covered. We work together to create stunning artwork and award winning photographs, to tell your wedding story in an beautifully emotive manner. I have been documenting weddings since 2013, and have approximtely 100+ weddings under my belt. After your wedding, we'll return to the studio, backup the images, and begin the culling process. Thousands of images are taken on a wedding day between both photographers, many of which are trials, blinkers, test shots, duplicates, etc. We cull images down to an average of 50-75 images per hour of coverage for the final gallery. This allows for a wide variety for our clients, while also keeping to our professional standards. Images are first color corrected and straightened. Because we aren't just slapping a filter on our images, but rather hand editing each one, this process cannot be rushed. While our contract gives us 6-8 weeks for final delivery, it is commonly less depending on the season. We'll be sending along sneak peeks and a gorgeous highlight before the final gallery is ready. Always. It's an extremely important part of our workflow. Each camera includes 2 card slots, and one is always backing up to the other. After your session or wedding, your images are placed on two hard drives, one of which is placed in a fire proof safe, along with all of the main SD cards. SD cards are only recycled and used again when your images are electronically delivered. Yes. Your gallery will be delivered electronically and images will be available for downloading upon delivery of your album, prints, or wall art. We use a website called Shootproof, which provides gorgeous layouts and intuitive design which will allow you to share, download, and purchase prints and products right from the gallery. We most definitely do, within the United States and internationally. The cost varies on the location, but we'll provide you with a custom quote upon contacting us. We will book our own airline and rental car/transportation if needed. We are also available to travel for engagement sessions and adventure elopements. We'd be honored to capture your love in a place that is special to you both, whether that be on your favorite beach, or by hiking a mountain to say your vows at the summit. I'd love to. Engagement sessions are always complimentary with a collection. It's a great time to not only to capture your love in a more relaxed setting, but also hang out and get to know each other better before the big day. We'll spend an hour or three around a location of your choosing, creating fun art and documenting a little bit of your lives, followed by a drink or coffee on me. While a lot of our work revolves around telling an authentic story, we will definitely take a short time to set up formal family photographs, usually directly before or after the ceremony. 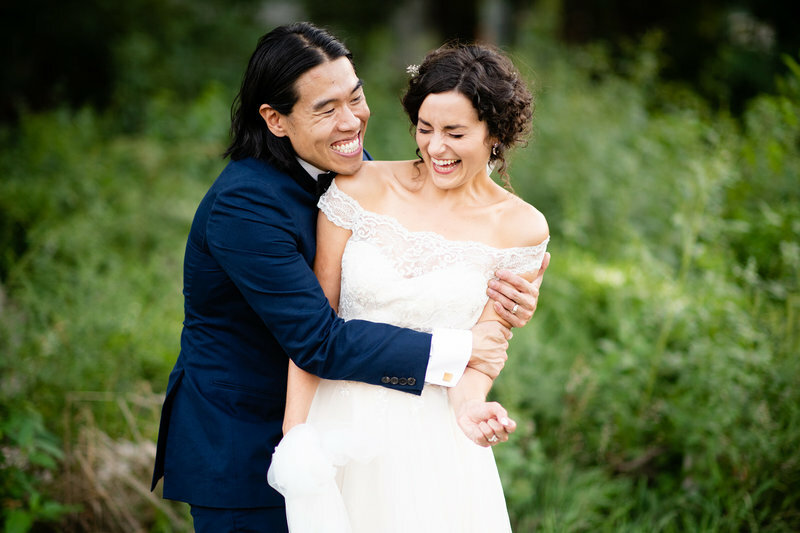 We have a family formal system down to a science, and this time generally goes quickly, as we know you'd much rather be out taking your newlywed portraits, or heading to the reception for all the fun! We also don't believe your wedding day HAS to have a photo shoot involved, so this will be completely up to your discretion. We are more than happy to head out around town for fun portraits with your bridal party and new spouse, or we can keep it short and focus our energy on documenting your story as it unfolds. If you do decide on a wedding day portrait session, we can discuss what your priorities are and set aside the best amount of time with the best light for this to take place. We completely understand, which is why we've started working with a company that offers a GIFT REGISTRY for your friends and family to contribute to your wedding photography collection and/or products. We are very honored you want to work with us, and we'd love to work with you too! Once the contract has been signed, we'll set up your custom link where your guests can contribute towards this timeless gift. Real. Timeless. I have been trained by some of the top wedding photojournalists in the world and am always searching for those raw, authentic moments that may otherwise be missed or forgotten. Light, composition, and emotion are elements I am constantly looking for to tell your story in a compelling, memorable way. I believe wedding photography doesn't have to be stereotypical, or boring, and should reflect the humanity and true nature of my clients. Our editing is bold and colorful, with the exception of black and white images, which are carefully chosen and edited in a way that will bring a lasting impression on the viewer. How many photographers will be at my wedding? HAVE MORE QUESTIONS OR READY TO BOOK? LET'S DO THIS.